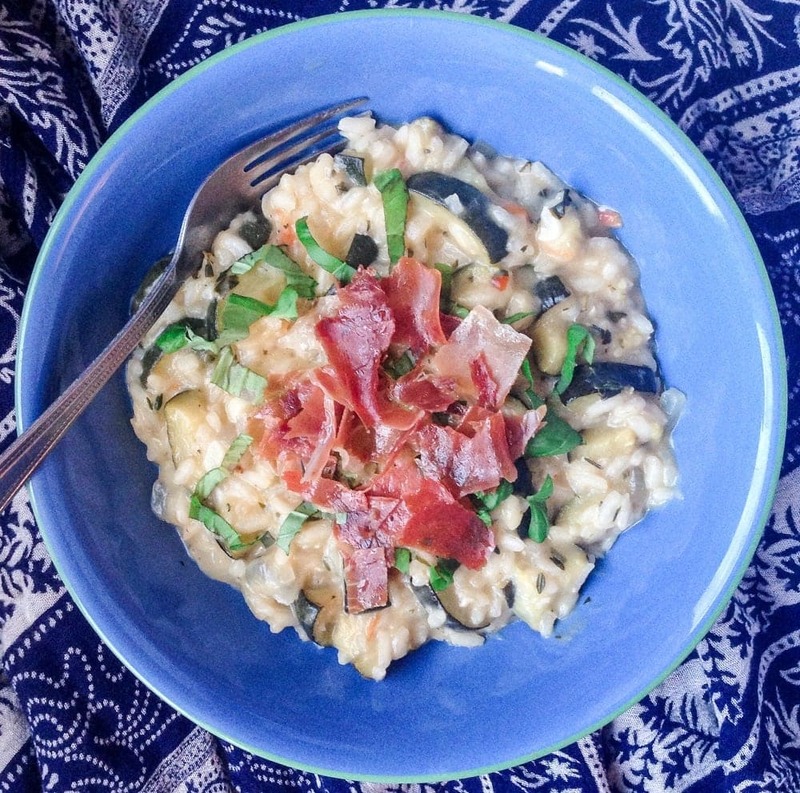 This courgette risotto with goat’s cheese and prosciutto is the perfect combination of creamy and salty. Risotto is one of the first things I learned to make. I remember it was a mushroom risotto from one of Jamie Oliver’s very early cookbooks. I think one of the Naked Chef ones (jeez that’s a throwback huh?). Good old Jamie. I made it for my family and somehow this landed me the reputation of being a great risotto maker. Rather embarrassingly my parents like to bring it up regularly, especially when I was younger. Legit though, I’m pretty good at making risottos. And I love eating risotto too. It’s one of those perfect comfort foods that makes me feel all warm inside. Which is handy since it’s been raining and miserable for the past few days. 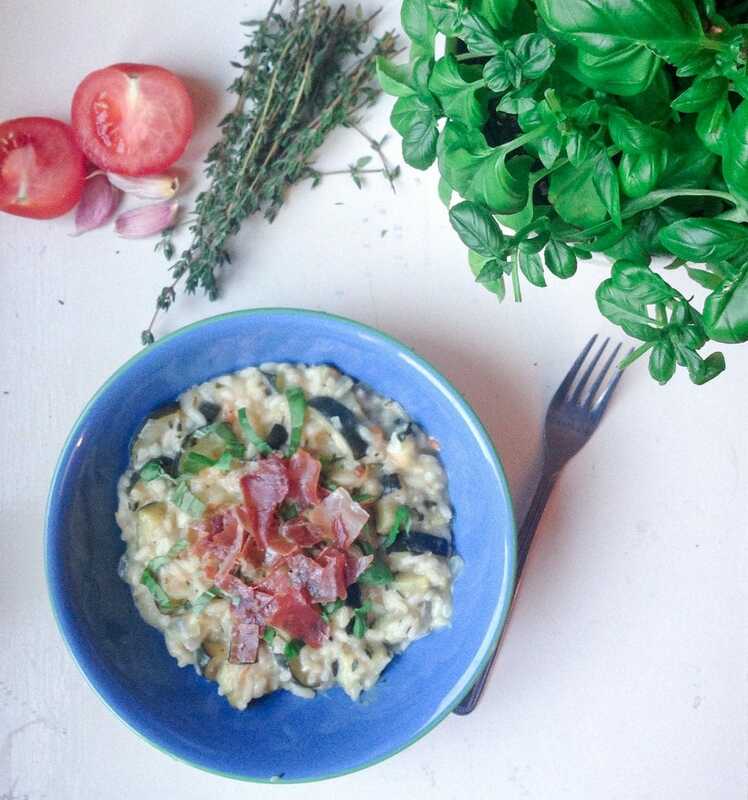 So this particular risotto – fresh courgette,creamy goat’s cheese, salty prosciutto, fresh herbs, parmesan. Basically just a list of some of the best foods ever in a risotto right? I also ended up snacking (obviously) on some of the fried prosciutto off the board where I’d just chopped the basil and thyme and that combo is unreal. Fresh herbs = the best ever. Fresh basil = even more the best ever. 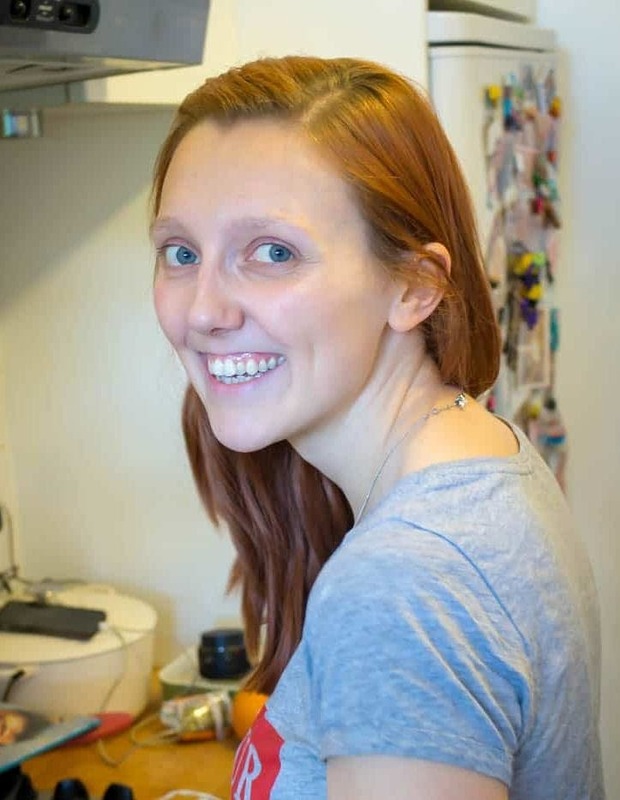 What are your favourite risottos? I made this insane Roasted Sweet Potato Risotto from How Sweet Eats a few years ago for Christmas eve dinner – who would’ve thought to put sweet potato in a risotto though – pure genius right there! Make sure you top this with some extra basil or any other herbs you fancy. Also if you have any extra goat’s cheese then sprinkle chunks on top, they’ll turn into melty little pockets of cheese and will literally make your day, trust me. 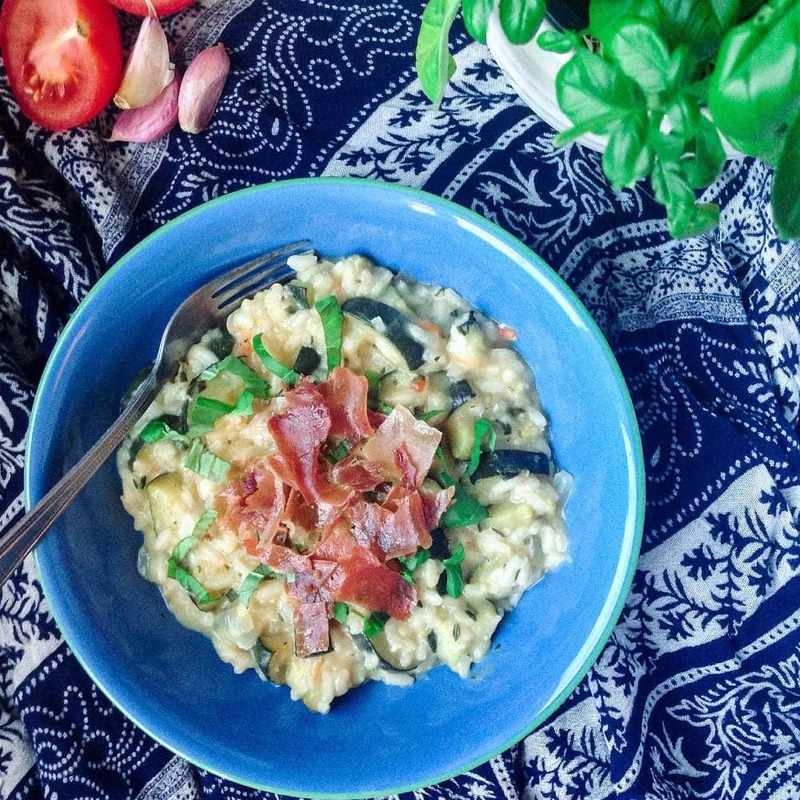 This courgette risotto with goat's cheese and prosciutto is the perfect combination of creamy and salty. Heat the teaspoon of olive oil in a frying pan over a medium heat and then fry the prosciutto slowly until it has turned crispy. Remove from the pan and place on some kitchen towel to drain the excess fat. Once the prosciutto has cooled you can chop it ready to use for the finished dish. In a large pot heat the rest of the olive oil over a medium high heat. Add the courgette and cook for 10 minutes until it has softened and browned slightly. Add the garlic and chilli flakes and cook for another minutes before adding the onion. Cook everything for another 5 minutes. Add the rice and stir to coat. Then add the white wine and cook until nearly all the liquid is gone. Add the basil, thyme and a ladleful of stock. Wait for the stock to be absorbed and then add some more, continuing the process until all the stock has been used or until the rice is completely cooked. You may not need all the stock. Once the risotto is finished remove it from the heat, stir in the goat's cheese and parmesan and serve topped with the prosciutto and extra chopped basil. Wondering what to do with the leftover ingredients you’ve got from making this recipe? Any extra basil leaves can be used to top this cheesy one pot pasta. Leftover courgette can go in this super simple cougette and carrot stir fry. You could always add some prosciutto to this wild mushroom ragu in place of the bacon. And of course parmesan can be added to so many pasta dishes including this garlic pasta with roasted broccoli, chickpeas and chorizo! I love a good risotto and LOVE the idea of all these ingredients together. Yum!